His driving gave his mother one tense moment. 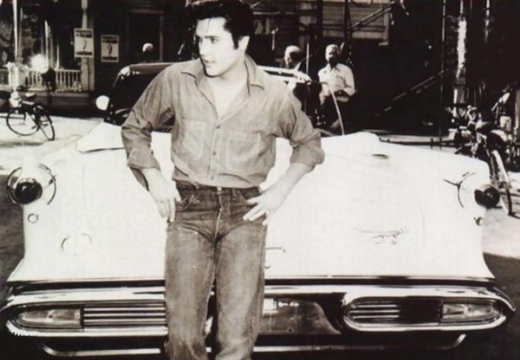 “We were parked facing a store and Elvis mistook forward for reverse and dropped the clutch. The car shot right up onto the curb and I thought we were going to go through the store window. But Elvis kept his head and stopped me just in time”. 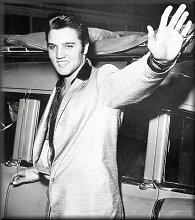 He gained his next driving experience after the family moved to Memphis, and went back to Tupelo for visits. 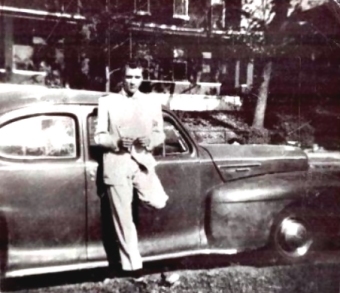 Vernon recalled, “The accelerator of that old Pontiac we had was so stiff my foot would get tired, so Elvis would sit in the middle and feed the gas while I steered.” “Elvis was almost seventeen when he went for his driver’s license,” his mother continued. “He borrowed my brother Travis Smith’s car – that was newer – to take the test and he had no trouble.” His father added, “After that there was no keeping him away from the wheel. I remember once when we were living in Lauderdale Court. It was a hot night and everyone was outside. His first date was without benefit of a car. “He was 14 years-old, I guess, and usually he came home from school about three o’clock. But this day he never showed up. I was that worried I was crying by the time his father got home.” “I went looking for him,” says his father. “I asked around until I learned he’s walked Bonnie Jean Davis home from school. That’s where I found him, just fixing to sit down to have supper with the Davis family. It wouldn’t have looked good to break that up, so I went home and told Gladys to quit crying – he was all right. He was a senior when he participated in the Road E O and had his picture taken changing a tyre. When he came home, he told us that he had lost the race because of his sideburns. He was disappointed; cause he just didn’t like to lose at anything. Former manager, Bob Neil recalled at the time, “With him playing shows in all sorts of different places, good transportation was a necessity, so I helped him arrange finance. Nothing but a Cadillac would suit Elvis, so we located a good used one. The first night he had it he was so happy he sat up all night at a hotel-room window, just looking at it.” That car, unfortunately, brought Elvis two near death disasters. 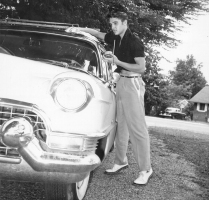 In early March, 1955 Elvis had bought his first Cadillac. It was a pink and white 1954 Cadillac and provided transportation for Elvis and the Blue Moon Boys for about three months. The car went up in smoke when a brake lining caught fire, on the road between Hope and Texarkana, Ark. in June, 1955. Note the roof racks in the pictures below, they were used to carry the Blue Moon Boys equipment. A Mercedes-Benz, once owned by Elvis Presley, was sold by Bonham’s on Dec. 7, 2010, at Surrey, England, for £80,700 – US$187,390. Restored to a very high standard, the rare piece of Elvis Presley history attracted a great deal of interest internationally. It ultimately sold to a bidder in Germany.